Trevor’s Shawn Stables (left) engages in a conversation with Leah Dinchak, who has been recovering from an accident last summer in Illinois, during a “Love for Leah” benefit at the Parkway Chateau in Kenosha on Nov. 10 (Jason Arndt/The Report). 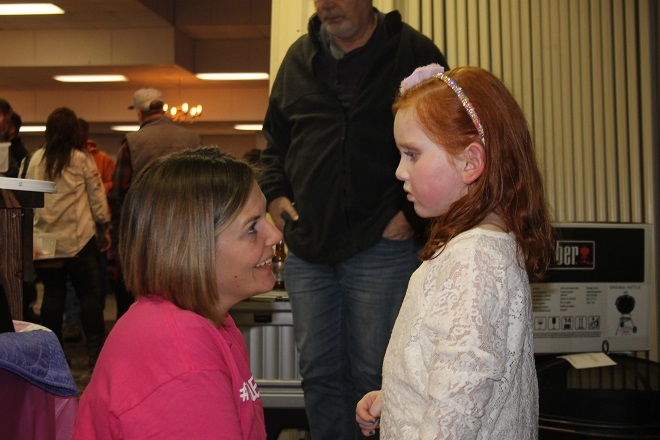 At a packed Parkway Chateau in Kenosha on Saturday, where hundreds attended the Love for Leah benefit, guest of honor Leah Dinchak did what any 5-year-old does. Dinchak, of Trevor, was seen smiling, tugging at her father Blake’s arm for attention and even proclaimed she recently lost her first tooth. Three months ago, however, brought a different scenario for the outgoing redhead. In Lindenhurst, Ill., on Aug. 10, when she and her family were on their way to Lindenfest, Leah was struck by a vehicle while crossing Grand Avenue from Hillcrest Lane at about 7 p.m.
Leah, according to her mother Jenni, flew up in the air and landed 20-feet away. Upon discharge on Oct. 21, Blake admits he and his wife were nervous, considering she still has physical limitations. The physical limitations, according to Jenni, included diminished mobility on her left side. “She got home on October 21. We were very nervous. She has that outgoing personality, so she wants to run before she can walk,” Blake said. Meanwhile, as her parents continue monitoring Leah, the community rallied around, organizing multiple benefits and holding vigils in both Wisconsin and Illinois. “From the very beginning, we were blown away by the amount of donations that we have had coming in, (and) the amount of people that have offered their services,” Jenni said. The event at the Parkway Chateau brought in at least 80 volunteers to help distribute raffle prizes and live auction items. Leah, Jenni said, was excited about the Nov. 10 benefit when they told her. “She has been looking forward to this for a while. When we got home (from the hospital), that was the first time we talked to her about it,” Jenni said. Blake said his family is grateful for the outpouring of love the community has shown. “The amount of support she has had, the thoughts and prayers – we really appreciate that,” Blake said. Edward Devall, of Wheatland, is a relative of the Dinchaks and said the benefit turnout was humbling. “This is unbelievable how people in the community have come together,” Devall said. Although Leah’s personality shined brightly on Saturday, her parents said she still faces a lengthy recovery process, including multiple therapy sessions at the Shirley Ryan AbilityLab. “She is not close to being done. Right now she goes to day rehab in Glenview, Ill., Shirley Ryan, for three days, Mondays, Wednesdays, Fridays, three hours a day,” Jenni said. Because Leah also suffered a brain injury, according to Jenni, the youngster needs cognitive therapy. Leah, who was supposed to start kindergarten at Trevor-Wilmot Consolidated School, receives in-home tutoring from the school. While the process is long, Leah has shown positive progress, Jenni said. “There are very positive strides that she is making, so we are very happy with that,” Blake said.